Choose between 8 or 15 days of use, depending on what suits your travel needs! We got 2 simcards while traveling in Chengdu city, 1 for my wife and 1 for myself. We were able to pick them up at BKK airport on the following day after the purchase. Installation and setup was easy and must only take place in China. While there were some instances where we had no signal (in the city and at some tour sites), we had access to the internet for the most part. It is true that VPN is not needed with this simcard. We were able to access Facebook, Gmail and other websites/apps that would've been inaccessible in China. Not sure if hotspot is allowed with this simcard. 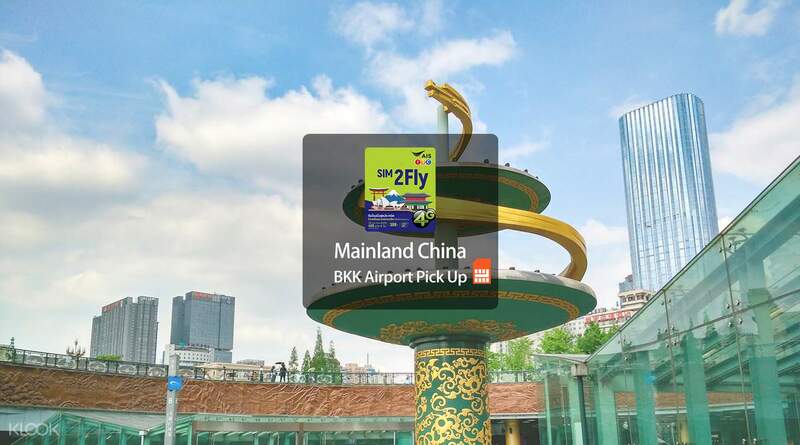 Explore Chengdu while staying connected with your friends and family by purchasing this 4G SIM card from AIS, one of the three main mobile operators in Thailand. Simply book the SIM card through Klook, then show your voucher at the Klook counter in Suvarnabhumi Airport (BKK) and you're good to go! Go online the moment you land at your destination with a simple activation procedure, and you'll enjoy unlimited 4G data valid for 8 or 15 days, perfect for sending those holiday snaps, looking at maps for directions, and staying on top of your emails. You'll also stay connected as you travel across borders with the SIM card's multi-country coverage, valid in up to 40 countries. Stay connected in Mainland China, plus enjoy up to 4GB worth of data for 8 or 15 days from AIS! We got 2 simcards while traveling in Chengdu city, 1 for my wife and 1 for myself. We were able to pick them up at BKK airport on the following day after the purchase. Installation and setup was easy and must only take place in China. While there were some instances where we had no signal (in the city and at some tour sites), we had access to the internet for the most part. It is true that VPN is not needed with this simcard. We were able to access Facebook, Gmail and other websites/apps that would've been inaccessible in China. Not sure if hotspot is allowed with this simcard. We got 2 simcards while traveling in Chengdu city, 1 for my wife and 1 for myself. We were able to pick them up at BKK airport on the following day after the purchase. Installation and setup was easy and must only take place in China. While there were some instances where we had no signal (in the city and at some tour sites), we had access to the internet for the most part. It is true that VPN is not needed with this simcard. We were able to access Facebook, Gmail and other websites/apps that would've been inaccessible in China. Not sure if hotspot is allowed with this simcard.